Welcome to Persistence Of Vision, where the spotlight is thrown on animation history’s illustrious past, present and future! So how better than to start with a brief overview on the making of the “one that started it all”, Walt Disney’s 1937 triumphant Snow White And The Seven Dwarfs? 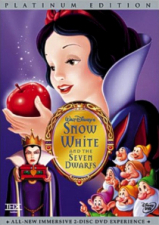 Restored and released as the first of the series of Platinum Edition double disc DVD sets from Disney, Snow White changed not only the face of animation, but of film-making in general. Without it, we wouldn’t have had MGM’s The Wizard Of Oz that followed it soon after in 1939, or many of Disney’s subsequent animated features. Mickey’s public debut, Steamboat Willie, was an instant hit on its release on November 18 1928, and Disney’s reputation was assured. 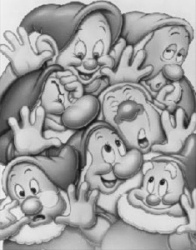 Going from strength to strength, Walt finally gathered his top artists in one of the storyboard rooms in 1934 (around the time that the Studio had switched to fully color cartoons in its Mickey Mouse and Silly Symphony series) to tell them a story and let them into his most audacious gamble yet. They would make the first full-length Technicolor animated musical feature film, based on the Grimm Brothers’ Snow White And The Seven Dwarfs. Acting out the whole tale, performing voices and hunching his back in order to portray the evil Queen, Disney inspired those in the room so much that animators Ken Anderson and Ollie Johnston later commented that the film, although lauded in Hollywood as a masterpiece, never did turn out quite as good as Walt told it! Most of the staff continued to work on the Symphony and Mickey cartoons, but a select few were busy, hard at work designing and coming up with concepts that would shape Snow White. Around this time, differences in some of the Symphonies cartoons began to show up. Techniques that would be used in the feature were developed and adapted, with the most celebrated and famous of these being the Multiplane Camera – a new kind of animation apparatus that gave the illusion of depth to the artwork in a much more believable way. It was first used and extensively tested in the 1937 short The Old Mill. Another cartoon, The Goddess Of Spring, was basically an experiment to see if a human figure could be drawn convincingly. The short appears on the Platinum Edition, but for those who have seen it, the answer was: “more training”! Soon, there were nightly animation courses on offer for the Studio staff. The story goes that when Walt heard that some of his top animators were gathering each evening to study the female anatomy, he ordered the classes to be moved to the Studio on official grounds. After all, as Disney stated, he could not have his animators known to be looking at naked ladies after hours! Known for the four years it was in production as “Disney’s Folly”, Hollywood was sure that the film would fail and bankrupt the still young Disney Studio. Not for the first time (and most definitely not for the last!) Walt threw caution to the wind and continued to push ahead with his dream film. He had chosen Snow White among a selection of stories (also on the cards were Cinderella, Peter Pan and Alice In Wonderland) due to a silent version of the story that he had seen in 1916 in his hometown of Missouri that had made a lasting impression on the young boy. Knowing that the original Grimm Brothers story had all the pathos and romance that he felt was needed to create a memorable film experience, Walt decided to up the humor quota by giving each of the Dwarfs their own individual personalities. Originally there were over 40 names and characteristics suggested, which were of course finally whittled down to the magnificent seven: Dopey, Sneezy, Bashful, Happy, Sleepy, Grumpy and Doc. Other names that came and went included Scrappy, Hoppy, Weepy, Snoopy, Gabby, Silly, Flabby, Daffy, Dizzy, Puffy, Biggy-Wiggy, Jumpy and Awful! In previous versions of the story, the Dwarfs all acted as one, but the decision to create separate characters, as Walt had learned from the 1933 Silly Symphony success of The Three Little Pigs proved to be the film’s masterstroke and took the story in new directions. Under animator Fred Moore, who had designed the Three Pigs, these characters would not just be supporting players. They would, in fact, save the day! Providing the flip side to the Dwarfs comical performances was the Wicked Queen herself, a wonderful creation who hid her twisted and bitter hatred of Snow White under her calm and beautiful smile. Her transformation into the evil Witch is one of the film’s highlights – a brilliant montage that would have shocked audiences back in 1937! Bringing the vocal chill to the Witch was Lucille La Verne, and when no better casting could be found, she provided the dulcet but cold tones of the Queen as well. Finding a voice for Snow White herself was a much tougher task. The call had gone out all over Hollywood for a voice that would reflect that of a young girl. After auditioning hundreds of girls, casting director Roy Scott telephoned Los Angeles singing coach Guido Caselotti. Evesdropping on an extension line was Caselotti’s 19-year-old daughter Adriana. She piped up during the conversation and Scott immediately asked her in for a reading. When Walt heard the voice, he jumped up in enthusiasm, and had found his Snow White! The other voices in the film were somewhat easier to find. The Dwarfs’ roles had been given to popular radio names, with Pinto Colvig in the running due to his performances in many of the Disney shorts, not least as his regular guise in the character of Goofy, and Harry Stockwell (father to Quantum Leap’s Dean) became the handsome Prince Charming. Eventually, due to overruns and budget constraints, Walt ran out of money. The Bank of America was offered to view the incomplete film by Roy O. Disney, something Walt was adamantly against. All through the screening, the banker sat silent until the end when the lights came up. He nodded at Walt and made a call to the bank: “Give Mr Disney the money”. The film was finally completed, coming in on time, but at six times over the original budget – and $1.5 million was a lot of money back then! Opening night came on December 21 1937 at the Carthay Circle Theater in Los Angeles. The top stars of the day – Marlene Dietrich, Judy Garland, Mickey Rooney, Charles Laughton et al – gathered at what was one of the biggest nights of the year. 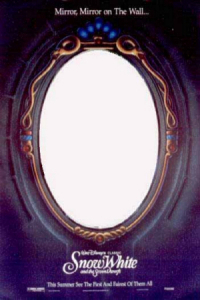 Ward Kimball, who had animated the famous Music In Your Soup sequence that had been cut from the final film, was astounded that these people – his idols – were sobbing their hearts out at the apparent death of Snow White, only to stand and cheer at the film’s happily-ever-after ending a moment later. “These were cartoons, just drawings” he said later, “but they gave definite emotion and were real for the audience”. The applause was echoed a few months later, when Walt was called to the stage of the annual Academy Awards. Presented with an honorary award for “a significant screen innovation which has charmed millions and pioneered a great new entertainment field for the motion picture cartoon”, the special trophy was larger than usual, made up of a regular Oscar on a podium, followed by seven smaller statuettes! Walt’s dream movie was a success, also taking home awards for its songs and score. 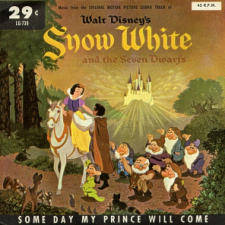 In fact Snow White also became the first film to have its complete soundtrack released on phonograph record in a multi-disc set, as part of a huge merchandising and promotional campaign. 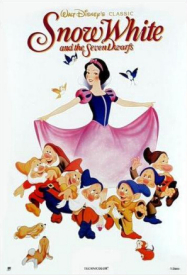 Snow White And The Seven Dwarfs was the unprecedented hit of the time. On its initial release it brought in over $8.5 million – a feat even more unbelievable when considering that the average admission price at that time was 25 cents, and children, who made up the bulk of the audience, paid only a dime! Over time, the film has brought in close to $200 million – and that’s before adjustment for inflation. In 1993, in the last theatrical re-issue for Snow White, it was reported that if adjusted for increasing ticket prices the film would have made close to $6 billion! Part of the reason Snow White was a success worldwide was Walt’s attention to detail for each foreign territory that the film was released in. For instance, in France the Princess became Blanche Neige, and all the writings in the Queen’s book of spells, and the names on the Dwarfs’ beds were translated in the artwork. 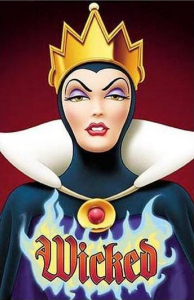 In 1987, the Disney Company celebrated the 50th Anniversary of Snow White by giving her a total visual makeover. The restoration team at YCM Labs, who had carried out similar restorations on classics such as Gone With The Wind and Hitchcock’s Vertigo, painstakingly toiled to remove scratches and dirt from the original negative, in order to strike a new theatrical print. A few years later, for the 1994 video release, Snow White became the first film to be totally digitally restored. This meant taking each frame of the film into the digital realm, and using a paintbox device to literally touch up every remaining blemish and pop that the 1987 restoration could not have even attempted to achieve. The audio underwent a similar process. Using the original mono track elements, the mixers at Buena Vista Sound were able to give more dynamic range, punch and the effect of surround effects to Snow White. The results of their work were issued on VHS and the amazing special edition LaserDisc box set, which is still a prized possession among Disney fans, even if they now own the Platinum DVD. The LD contained the restored film, with an extra disc full of bonus material, much of which was ported over for the DVD edition. Exclusive to the LD box however was the inclusion of a limited run of 10 lithographed prints of theatrical posters for Snow White’s re-issues, as well as the informative hardcover book Snow White And The Seven Dwarfs And The Making Of The Classic Film. 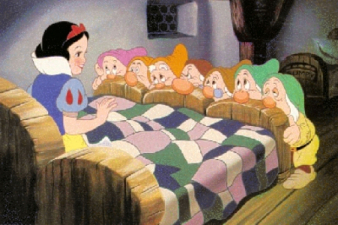 Although the DVD loses these physical extras, the DVD retains much of the content, including the fully animated sequence of the Dwarfs slurping their soup, to the disgust of the Princess. Animated by Ward Kimball, the sequence was dropped by Walt who felt that it did not push the story ahead. Kimball “was crushed! I’d spent eight months animating that thing!” he would later lament. Although glimpsed at during documentaries over the years, and included in the LD set, this is the first time a wide audience has seen this material in full, and it almost is worth the price of admission for this reason alone! The DVD also goes one better than the LD – adding a 5.1 track to the film and an even more extensive clean up. You won’t believe this was made back in 1937! It was even suggested at one point during the production of the DVD, that the Soup Song sequence be cleaned up and colored for the release, and perhaps included in a branched “special edition”. 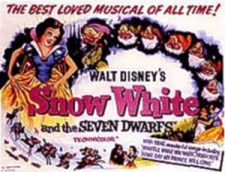 For those who have the set, you’ll know that this was not to be the case – maybe we’ll get that when Snow White next hits the home video market, potentially on Sony’s high definition Blu-Ray format for its 75th anniversary in 2012. For those who do not yet have the Platinum Edition, the only advice can be to hunt and low for a highly recommended copy! NOTE: Walt Disney’s Snow White And The Seven Dwarfs is officially on monotorium. Legitimate stocks can be found out there, but beware of bootleg fakes. Read our review of the original Platinum Edition DVD release right here!